One of the biggest challenges prophetic people have, and those receiving the prophetic word, is understanding the timing of the word. When will the word actually happen? This is critical to keeping our faith and hope level up. Yes! If we understand the timing of the word then we are able to stand in faith for it. In this post I am going to show you some patterns which you can use to discern the timing. Will I give you the exact timing of your word? No. I honestly don’t think anyone can do that. Why? Most prophetic words have warnings, instructions, conditions attached to them. If you don’t follow and obey what God is showing you will not receive the promise. It really is that simple. (Isaiah 1: 19-20) If you are willing and obedient, you will eat the good things of the land; but if you resist and rebel, you will be devoured by the sword.” For the mouth of the Lord has spoken. Absolutely nothing in life replaces obedience. Nothing. Therefore, you can delay the word. There are 2 things that you need to understand for the word come to past. (1) Your understanding of the time and season that you personally are in. (2) When God’s Kairos time has arrived. Everyone of us is on a different timeline. God has seasons in which He works (Hebraic Calendar) but the timing of your own word comes after you have completed your process, obeyed and then it collides with the Kairos timing of God. The word time here means Kairos. There is a specific time when thing happen. That means when God gives you a prophecy, a dream, a vision there is a Kairos time associated with that and it will surely come to pass. When I first started in the gift of prophecy, I didn’t understand this. When the prophetic unction of the Holy Ghost would come upon me it felt so urgent in my spirit that I was convinced things would happen that day or that week. When it didn’t I just thought I imagined things and they were not real. This was not true, I just didn’t understand the gift of prophecy, kairos timing of God and my need for an Issachar anointing. I don’t believe in praying for gifts because I believe God gives you the gifts that He knows is best for your personality type and your calling. However, there are some gifts that work in tandem with others that will cause you to have a greater degree of accuracy and use your giftings better. If you have the gift of prophecy, you need to pray for an Issachar anointing and the gifts of discerning of spirits. If God takes you into the gift of tongues, pray for the interpretation of tongues. Yes, even your own tongues. It is moving in understanding of God’s timing and season with wisdom. Spend some time studying the tribes, the layout of the tribes and which ones were grouped together. In this a lot of revelation will flow to you on God’s order of things. Numbers 2:1-9, specifically shows the tribes grouped together. The first one is Judah (Praise), followed by Issachar (Timing and Wisdom), followed by Zebulon (War, Trade, Ships – Business). You need to war for the promise and pray in your provisions for it. This is the layout that God has given in the model of the tribes. If we look at the life of David (1 Samuel 16) we see that he was given the prophetic word by Samuel that he would be King at the age of 15. However, he still had to go back to tending the sheep and living his life until the Kairos moment arrived. The next thing that happens is God puts a distressing spirit on Saul and now he needs someone who plays the harp to soothe him. David’s gift now makes room for him and he ends up in the palace playing the harp for the King. So here he is looking at his promised position but still unable to touch it. Now, if you are tracking the prophetic word you will see that it came closer, he moved from the stable to the palace. There was movement. What happens next is he becomes best friend with the King’s son, Jonathan, and marries the King’s daughter, Michal. Now he’s family!! There is further movement. 1 Samuel 18:30 says that in all that David did he operated in great wisdom so he gathered a huge following/supporters because of how he interacted with others and acted. What happens after that is immense warfare. The enemy gets really nervous when he realizes that you are nearing the promise. The attacks start coming from everywhere. How you respond will determine how long you stay in this season. God will then start testing you to see your level of commitment to the promise. David was given more than one opportunity to kill Saul, did he do it? No. He recognized that God gave Saul his position and therefore, he respected and submitted to the authority that God put over him. If God promised David he would be King then God is well able to do it without David’s help. All David needed to do was walk in obedience and do what the Lord told him to do. A lot of you will go through the persecution and will need to step away from killing people (with your mouth) in order to see the promises of God fulfilled in your life. If you engage in this type of warfare (using your tongue to crucify people) expect your promise to be delayed. Even if they deserve it, stay out of that. Touch not God’s anointed (even if they are not acting right) they are in their position of authority for a reason (Romans 13:1-2). Leave them to God and keep your mouth off of them. So David, after Saul dies asks the Lord if it was time for him to return to Judah. He was 30 and that’s when he became king. And, still had to wait an additional 7 years to become king in Jerusalem. So he waited 15 years. Samuel died before this prophetic word came to pass but that didn’t stop David from continuing to walk in a manner that was worthy of his calling/the prophetic word. I want to share a teaching with you that God shared with me as it relates to Kairos timing and stepping out on his word. After I started praying earnestly to get the Issachar anointing one night he gave me a dream where I met this old man (around 70) who was covered in diamonds. We were talking but I don’t remember what was said. The only thing I remembered was his skin was made out of diamonds. A few days later I scratched my cornea. Has that ever happened to you? It is very painful. Well, through this painful experience the Lord brought me to this revelation. I went to see the Ophthalmologist. He was a new doctor. The doctor started to talk to me about presbyopia and using trifocals (totally aging myself here). I had never heard of trifocals before, only bifocals so I was very intent on hearing what he had to say to me. When we are young we have perfect vision, then as we age we may need bifocals (distance and near). 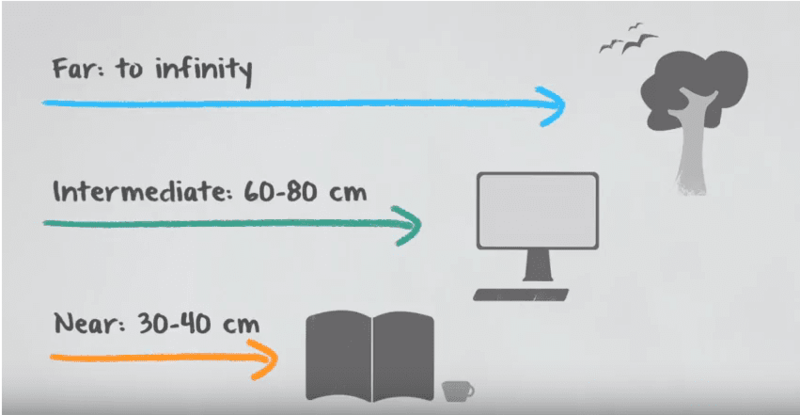 Then some of us develop presbyopia and we need trifocals which gives us 3 distances. With Trifocal glasses you have the ability to see things at a far distance, intermediate and those things that are near. 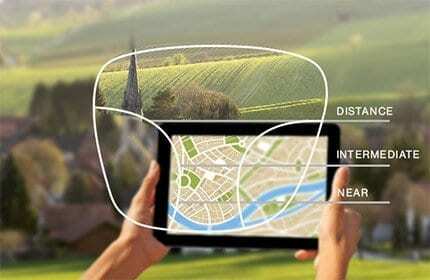 The lenses of the glasses are set up to accommodate all distances. The top of the lens is for far distance, the center is for intermediate (arms length away) and the bottom is for the things nearest to you which is usually reading. Some trifocals generally have lines which help you to determine when you’ve crossed over from one to the other. There are also lenses called progressive lenses which have no lines. I asked him, “wouldn’t I get confused when I’m wearing a progressive lens to know which area of the glasses I should use to determine the distance?” He said, “with constant use you will learn which part of the glasses you need to use to see an object” Then he said “that’s why most people start out with the trifocals with lines, it’s like having training wheels on, when you become really good at discerning which part of the lens you need to look through you can move into progressive lenses”. Whew! 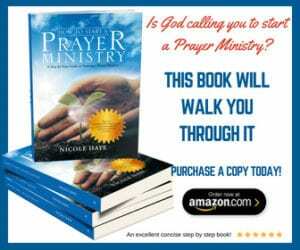 I seriously wanted to yell – Prophesy Dr. Diamond!!! ha ha ha but I couldn’t because he was talking about glasses and I was on another plain in the spirit. What I really wanted to do was pull out my phone, ask him to go back to the beginning and repeat everything he said so I could record it. But that would have seemed to weird, so I just asked the Lord to help me remember as much as possible and then I wrote it down when I got home. So this is the breakdown of what you just read. When you receive the prophetic word you need to discern the distance… Far (10+ years away), Intermediate (3 – 10 years away) or near (right now through to the next 3 years). This is step one. If you use the wrong portion of the lens you will get the timing all wrong. You’ll step out too soon or too late and miss it. So many people step out in the wrong timing and when the word does not come to pass they think the prophetic word was wrong, but it wasn’t. They just misread the timing of the word. Don’t try to change the timeline. You can’t force God’s Kairos timing. Surrender to it or you will have many headaches…and end up quitting! You can’t use someone else’s timeline to judge your own. Each one is custom fitted by the Creator, He knows you! Don’t compare yourself to others and don’t try to use someone else’s vision/lenses as your own. The customization of your timeline is precise and tailor made to you and it has to do with your gifts, calling and purpose in life. Once you get the prophetic word, and you are sure it is from God, you need to commit to it. When you don’t walk with a sense of commitment and purpose you will get confused. Make a commitment to the vision. So now, let’s talk about how you discern when something has moved from far to intermediate to near. God speaks to each of us in a different way. You can have a family of 4 children and if you ask each of these children to tell you about their childhood you’ll get 4 different versions. Some will see the negative, others the positive, and some won’t remember some of the events as others do. We have to speak to one child differently from another because they process the information differently. We have different gifts, so how God will reveal the movement in the timeline for each of us will be differently. So, you need to pay attention to how he speaks to you specifically. I’m going to give you some examples of this but this is just to be used as a guideline and not specific to your own timeline. I was speaking with a lady who said she had 2 occasions when God showed her something and it happened exactly as He showed her within 72 hours of her having seen it. Her process was like this, she gets a dream (she rarely gets dreams) within 24 hours of the dream she gets scriptures that line up with the dream, within 24 hours after that she has an open vision (she rarely gets visions) that shows her exactly what she should do next, she does what she sees in the vision, it happens exactly as she is shown. When she relayed it to me I told her God showed her the formula for your “Near Timeline”. She didn’t realize that’s what was happening until I pointed it out to her. I told her she has a formula from God on how things happen for her within a 3 day window period. I can tell you that you also have a formula but if you are not paying attention to how God speaks, writing it down, going back and checking it then you will never figure it out. God’s will is not for you to be stumbling around in darkness and being confused. Her formula is not my formula, and yours could be different too. I have noticed that when God gives a prophecy that is in the distance the word doesn’t have much confirmation around it at the time of the word. This is something that should be written down. You need to wait until He shows you it moved from distance to intermediate. How will you know it moved? Well, there will be a trigger moving you close to it. So let’s say the word came by way of a dream when you write it down you may have forgotten about it because it happened 4 years ago. Then one day something happens, really simple like a song playing on the radio and suddenly this dream from 4 years ago comes back to your mind. Why do you think that is? God just activated it and it moved closer. He uses these triggers to let you know He has not forgotten about the word He gave you. So you now need to record the date that this trigger happened. You’re doing this to establish your own timeline. After that you may never remember that dream again. Until…. Suddenly a few years after that everywhere you go you are reminded of this dream. Scriptures, dreams,visions, people referring to something that trigger it. Again and again and again. It’s with an urgency. This is how you know God is ready to bring this thing to pass. You need to determine how God speaks to you to determine the signs of your timeline. Pay attention to triggers. Pay attention to the frequency of the triggers. Watch for the warfare that will come during your near timeline and the devils of past seasons who will try to reattach themselves to you. Believe me, they are well aware that you are in labor. Stay away from that and prepare yourself to deliver. Look for God to test you because He wants to see if you are ready to receive it. Next Wednesday we will have the final part in the series which is how to step out and use your prophetic gift. 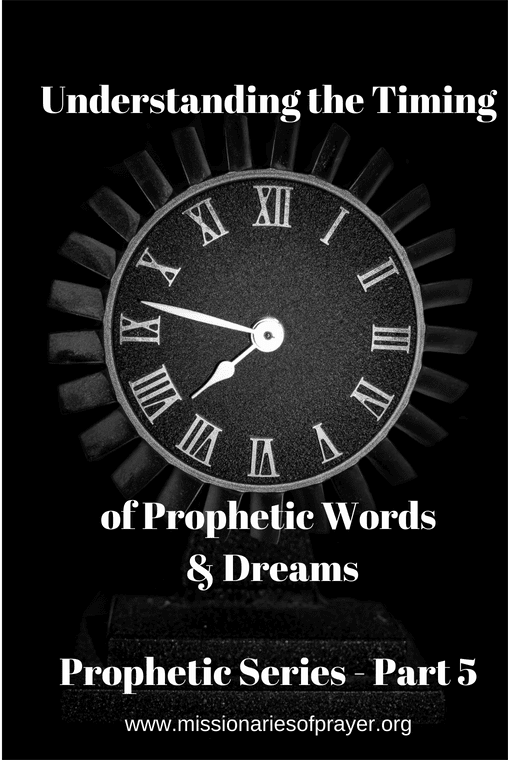 I pray this helped you in determining the timeline of your prophetic word. If you have any comments leave them below. Also, if you received additional revelation from my conversation with Dr. Diamond, please share! I had 3 back to back dreams on the same day in sept and dec 2016. They involved a man. The third dream both times was me walking down the aisle to marry this man whom i have never met, but i had total peace doing so. i could not see anything but him, and as i got closer, his heart and character was revealed to me, showing me how Godly he is. As we joined hands, a bright, white form came from behind us and put his hands over ours and blessed us. After the dreams, i asked the Lord, “How do i know he is a real man or that this is from you?” A few days later, i was at an event and i felt my head being turned by an unseen hand, and there standing in the balcony was the man from my dreams. He had a light around him as if the Lord was pointing him out as the one. Since then, I have been waiting and it has not yet come to pass. We have not formally met yet, and so i began to think maybe it was not from God. Any advice? How would we discern the timing of dreams or visions? For instance, I’ve had a dream where an angel took me to a marriage feast and I heard the Lord say, “Now is time to feast in front of your enemies”. And one where someone in a dream told me I only had to wait a few more weeks…would be indicative of a “near” time? Thank you. …I am going to go over all of them after the final one. Really helpful. Blessings. Thank you so much! I praise the Lord for your ministry. Over the past year or so Father God has greatly blessed me through your page. Rest assured that I will ‘remember’ you practically as soon as I can and you are on my daily prayer list. Blessings!